A multi-hulled boat, my first marine vessel. Features simple propulsion system with two independent motors. The idea for this construction first came in 2010, and it started with a catamaran, that is a boat with two hulls. 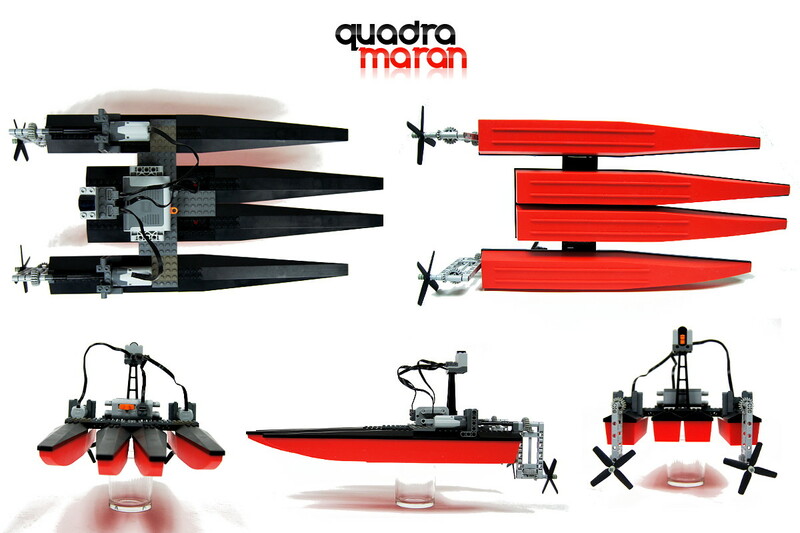 As the displacement of the Lego catamaran hulls turned out rather small (roughly 230 grams per hull), the project turned into a trimaran (three hulls) and then a quadramaran (four hulls) as more hulls were added. I suppose that the next step is something like a pentagramaran, with ability to float on liquid sulphur and fire black cats, but I was happy with four hulls giving a total displacement of 920 grams. The hulls are composed of two parts, lower and upper one. Their disadvantage is that if a hull is submerged too deep, or tilted, water can come in through the connection between the parts and the hull drowns in an instant. As I decided not to modify the hulls in any way (I have considered gluing them solid or sealing them with a wrapping film), it was my assumption that the weight of the vessel should be kept as low as possible to reduce the risk of sinking. Taking the risk of sinking into account, I have used the cheapest motors I had, as well as a regular battery box with regular batteries. 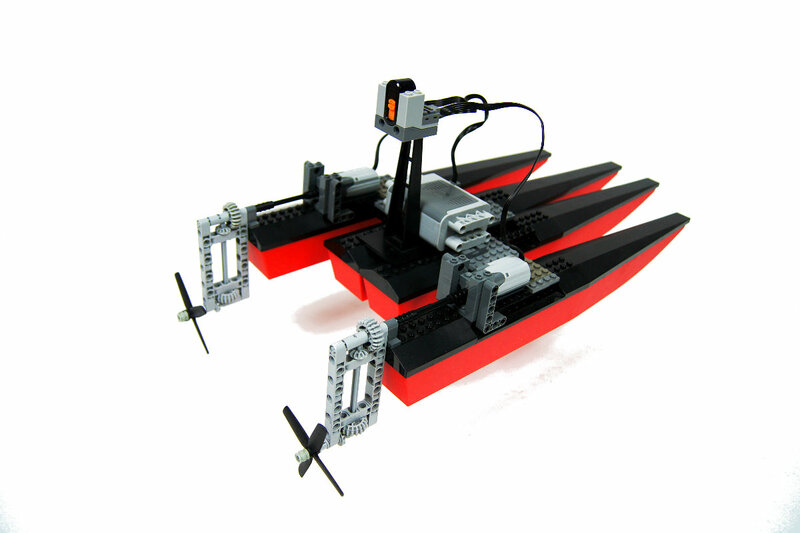 The construction is therefore very simple – there are two independent PF Medium motors geared up 1:2.7, driving two 4-bladed propellers made of two 9-studs long Lego propellers each. I assumed it will be more efficient to use a small gear acceleration and 4-bladed propellers than to use large gear acceleration and 2-bladed propellers, as high gear acceleration is always inefficient. I have also given up any ideas for a rudder system, as such a system would be more complex, less robust, and would require the power of at least one motor to be used only for steering. With two independent propulsion motors, the vessel can be steered like a tank and both motors can be used to propel it. Initial tests have shown the vessel to be relatively fast and very responsive to steering. The steering was so accurate that I was able to make a 360 degree turn perfectly in place with it. The vessel was tested on a small lake and performed above expectations, despite the presence of small waves and some algae that kept tangling into propellers when the vessel was too close to the bank. As it was easy to loose the IR link outdoors, I have used the PF speed dial remote to control it, because it makes the IR receiver maintain the last command if the link is lost. Thanks to that, it was possible to make the vessel take wide turns, going away from the bank and then back close to it. Eventually, as the vessel showed no tendency to sink, I mounted a camera on it. The result was fairly good, and I only regret that there was no space to put the camera back far enough to get the vessel’s twin bows in view. There was one advantage of the vessel not being built earlier – I was able to film it with my recently bought telephoto lens. Looking how the video turned out, I should have used a polarizing filter though. Could the propulsion and steering systems be build around a turntable, with a motor rotating the turntable for steering? I like this one better then your trimaran. I did, and they were terribly inefficient. About propellers, have vou tried with the small 3 bladed ones ? Their angle of attack is much higher than the large ones you used, which I find quite ineffective (probably because of the oval-shaped cross section of the blades) . Plus, the small ones can be ducted, which will help increase their efficiency. Hi, this is so cool I just know youre going to build a bigger one I’ll keep watching of course. as I see it’s (the hull) not particularly expensive, a few Euros for one… so basically one can buy a lot of them and build more complex vessels. 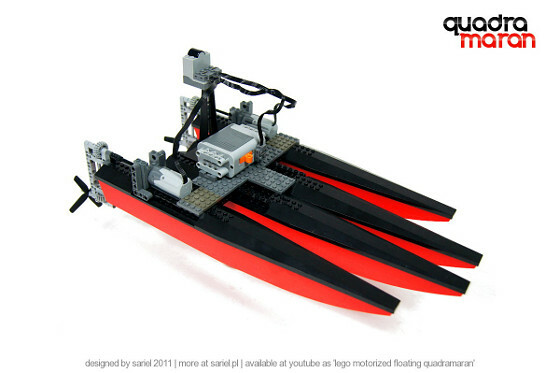 Question: have you thought about making a boat that isn’t powered by propellers under water? I mean, these propellers used as air propellers, geared up pretty good, maybe with a rudder behind ’em moved by a micromotor. Like those swamp boats. Catamaran set. 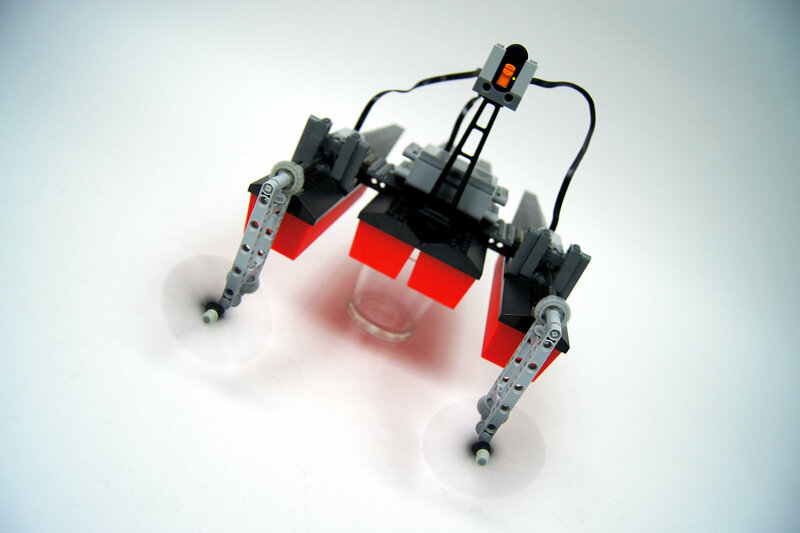 Check the Bricklink link. I have some bigger hulls already. But I like how these from Quadramaran are shaped. Are you planning to carry the boat theme as far as to buy some hulls, bigger ones from boat sets? You know, I provided link to Bricklink for this hull in the description. The hull…is it made by regular bricks or it is on solid piece? Hey Paul – very good filming skills ! You know have to add value to your models with that. Very good movie.